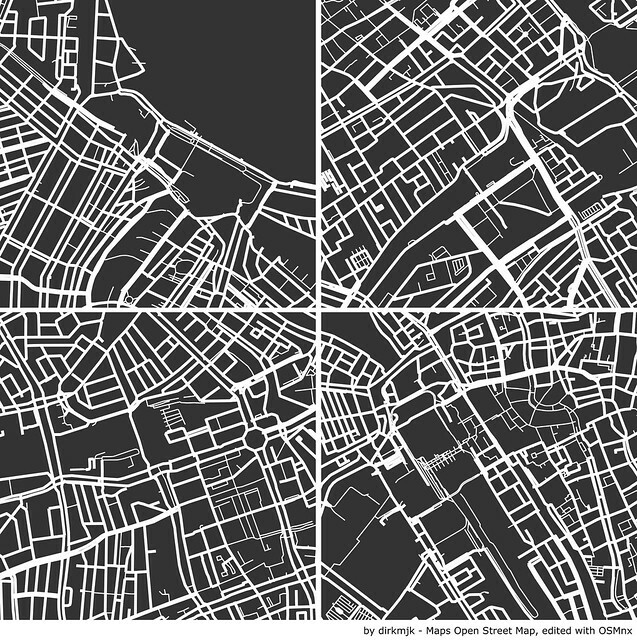 The image above shows square mile diagrams of cyclable routes in the area around the Stationsplein in Amsterdam, the Hague, Rotterdam and Utrecht. I made the maps with OSMnx, a Python package created by Geoff Boeing, a PhD candidate in urban planning at UC Berkeley (via). Square mile diagrams are a nice gimmick (with practical uses), but they’re just the tip of the iceberg of what OSMnx can do. You can use it to download administrative boundaries (e.g. the outline of Amsterdam) as well as street networks from Open Street Map. 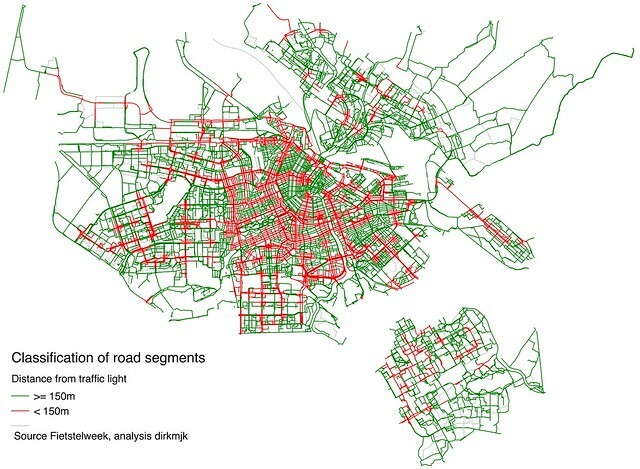 And you can analyse these networks, for example: assess their density, find out which streets are connections between separate clusters in the network, or show which parts of the city have long or short blocks (I haven’t tried doing network measure calculations yet). Boeing boasts that his package not only offers functionality that wasn’t (easily) available yet, but also that many tasks can be performed with a single line of code. From what I’ve seen so far, it’s true: the package is amazingly easy to use. All in all, I think this is a great tool. In the Guardian, London mayor Sadiq Khan has announced the launch of an investigation into the effect of foreign investment on the London housing market. In Amsterdam, concerns have been voiced over super rich Russians and Chinese buying up property, although this phenomenon is probably in its infancy compared to London. Newspaper het Parool reported that 15 expensive houses have been sold to rich Chinese and Russians in 2014 and identified a canal house, asking price 6.7 million euros, that had been sold to an ‘international investor’. The Guardian article mentions Juwai.com, «a website that aims to pair Chinese investors with property developers overseas». If Amsterdam property is offered for sale to Chinese buyers, it might be listed there, although houses may also be sold through less transparent channels. It turns out the site currently contains some thirty Amsterdam houses, offered for sale by Christie’s, Sotheby’s and other agents. The median asking price is about 1.6 million euros, with a maximum of 7.9 million euros. Unsurprisingly, they tend to be located in the posh areas of town: Canal Belt, Vondelpark, Zuidas. Incidentally, the website also contains quite a few houses in affluent villages like Aerdenhout. Juwai has published lists of most-viewed cities. In Q4 2015 Amsterdam was the 4th most popular European city among Chinese prospective buyers. In Q1 2016 it dropped to position 8, which suggests the ranking is rather volatile. Mind you, I have no problem per se with Chinese or Russians buying Amsterdam houses. I do think it’s a problem when rich people - be they Dutch or foreign - use houses as an investment object and drive up housing prices. But this is part of a broader problem, to do with issues like wealth inequality and the social housing sell-off. While the scale of speculation and unoccupied houses isn’t anywhere near what’s happening in London, the Amsterdam city government warns that «it cannot be ruled out that such developments will also take place in Amsterdam.» But as De Groene argued, that doesn’t depend on Chinese and Russians buying up canal houses, but on what we’re willing to do about our housing market. A practical issue I ran into was how to search a website in Chinese. In a variation on a trick I learned from Henk van Ess, I used Google Translate to look up the Simplified Chinese translation of ‘Amsterdam’. Then I searched for 阿姆斯特丹 site:juwai.com. One of the first search results was the page NLproperty, which, as you’d expect, lists property in the Netherlands. From there it was easy to find the property in Amsterdam. In 2012 heb ik de geografische ontwikkeling van de Amsterdamse trustkantoren in kaart gebracht. Sinds 2006 waren er veel van naam veranderd of verhuisd, waardoor vier belangrijke concentraties overbleven: Zuidoost, Prins Bernhardplein, Zuidas en Naritaweg. Onlangs ontdekte ik een nieuwe kaart (pdf) van belastingparadijs Amsterdam. Afgaand op deze kaart lijkt de geografie van de belastingontwijking sinds 2012 niet meer ingrijpend te zijn veranderd. De kaart is online gezet door Action Aid ter gelegenheid van hun AMSTERDAM TAX TOUR - THE BIKE EDITION, aanstaande vrijdag 9 september. Klinkt leuk en ik had graag meegefietst, maar helaas valt dit samen met een eerdere afspraak. Overigens heeft Wired een wereldkaart over belastingontwijking gemaakt, waar Amsterdam ook op staat.